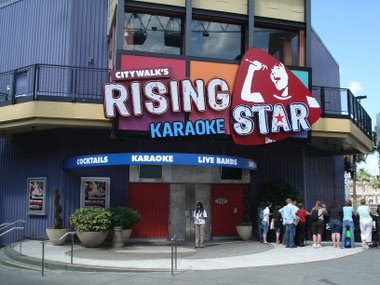 On a recent trip to Orlando Florida I discovered a place called CityWalk’s Rising Star. It’s karaoke with a twist – you do it on stage with a live band and back-up singers. Terrific fun. Now what’s that got to do with the favorite fried food I hear you ask, well, I’ll tell you. Rising Star has the usual variety of bar foods available to guests while they watch or wait their turn, and on that menu is a magical item called “The Potato Onion Web.” It’s described simply as beer-battered potato and onion, but it’s all that and more. Served in a basket, it appears to be nothing but golden brown hot fried lumps but is really a mix of battered and deep-fried chunks of crunchy, but soft in the middle, potatoes stuck together with frizzled onions. 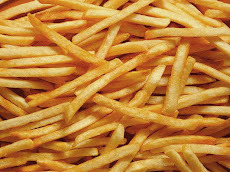 It’s a cholesterol nightmare and a heart-attack-waiting-to-happen but it’s oh-so-delicious. If you get down to Orlando, definitely check this out. Oh, and the show is good too.